Over the years I have seen many injuries. I have only worked in orthopedic outpatient settings since graduating, and yet I have treated things like Post-mononucleosis Fatigue Syndrome, CAD, and Pudendal Nerve Entrapment. But now and then we see the “little things” like Boxer’s Fractures. This mini series of posts is dedicated to three injuries and conditions that seem little in size but have huge consequences; the first of which we will dive into today. Broken Rib – I’ve never broken a rib and I do not want to ever break a rib. The current population that I work with fall more often than I was ever accustomed to when in school or after, and they also have slightly weaker bones, and this makes for a mess in the chest. On a scale of 1 to 10, I hear that broken rib(s) hurt a hell-of-a-lot! Typically they rank right below pregnancy and kidney stones as the most painful things people have experienced. But broken ribs are more than just painful, they are downright destructive! Hopefully by now most of us know how important proper breathing patterns are for good trunk stability, CNS functioning, and good movement patterns. And because broken ribs can’t be braced or casted, these loose ends of serrated bone are just free to stab our nerve rich intercostals, or rub against each other, making even the thought of a deep breath unbearable. 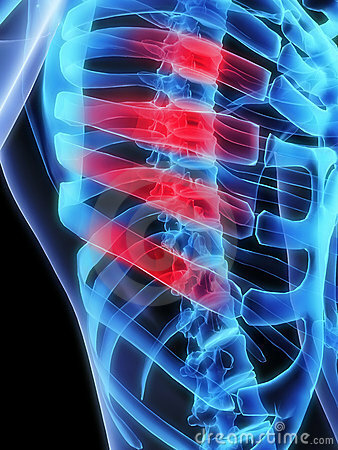 Without proper chest expansion, the diaphragm cannot descend properly (allowing for good trunk stability or breathing) and before you know it, the person who came in with tennis elbow who happened to break their rib on the slip-and-slide, is now being treated for low back pain 6 weeks later. But I digress. Without proper chest expansion we also lose thoracic spine extension. If you think about the sternum as a pump handle from one of those old-school water pumps, as the handle comes up, our thoracic spines have to extend; creating a mini joint mobilization EVERY. SINGLE. TIME! Once thoracic spine mobility decreases you can say hello to neck pain, shoulder pain,or even more back pain. I kid you not guys, these broken rib things are no joke. So Mike, what the hell do we do? Let pain be your guide. I hate saying that, but pain can make any movement pattern end up looking like Bambi’s first time walking, so why try to get back to discus practice when there are ragged boney ends rubbing each other. Typical bone breaks heal in 6-8 weeks in healthy adult populations, and broken ribs are no different. The pain subsides before this, but it is not a hall pass to return to sports. Check in with your doc first to get clearance. Up to that point, work on pain reduction, reducing the accessory muscle breathing patterns that will likely show up and the associated muscle tone in the upper chest/back/neck. If a fall is what caused the client’s break, examine their balance. You may be surprised at what you find. If not too painful, progress through a wide-to-narrow, double-to-single leg, high kneel – to – half knee to – standing, stable – to – unstable balance progression. Basically make balancing harder as they get better. Re-pattern faulty breathing once pain has subsided. The sooner this can be done the better. If you’ve ever treated someone who has broken a rib, or have broken a rib yourself, you know that it can derail everything else in your training or rehab. It may only be a broken rib, but the cascade of secondary issues that may arise make this one of the most underestimated injuries out there. Stay tuned for the other two injuries, and if you have any suggestions of your own, please feel free to leave a comment! Be sure to read this Related Post that answers some of the common questions I have been getting about this post. First off Chris, I cannot provide you with an assessment over the internet even with your thorough description (it’s against CA law). I can tell you that the bottom ribs are often called false or floating ribs because they do not attach to the sternum, and have the feeling of “floating”. I’d suggest taking a close look at some anatomy pictures to see what I mean. It is possible for partial fractures (of any bone) to become worse with pressure and stress. I’d suggest that if it continues to hurt you get to your MD and get an x-ray. Fell off my bike 6 weeks ago. Concussion and two broken ribs. Had 3 days in hospital. Pain from the ribs is horrendous for the first week out of hospital unable to do anything for myself, good friend had to shower and dry me. Day by day things have improved but it can’t be rushed. To begin with I could feel the ribs moving around which was weird. I have had to have time off work because of the ribs and the concussion but return to my job tomorrow. I now have pain in my right shoulder and underneath the shoulder blade where I think one of the ribs was broken, also if I try to use the right arm too much jet shooting pain down the arm. I guess for it to fully recover its just going to take time and patience. Hi, Mike! I really like your site! I went for a walk after dinner on Thanksgiving and tripped and fell hard on the cement, with my hand jamming into my ribs. (Hand was more or less like a fist for some reason–chuckled with pain at the “boxer’s rib”) At any rate, I have ongoing pain with movement, pain in several areas of the ribs which are actually hard to palpate, being mostly under the left breast. At times I have left arm pain too—I am sure it is not cardiac as it has to do with this rib pain and I haven’t died yet 😉 Just wondered if there are any large muscles that might have bruised or…does a rib fracture also cause arm pain? My gut feeling is there are a couple rib fractures, although there is no bruising or swelling. I understand totally about not diagnosing but just wondering what this could possibly be. I do have a doctor appt. in a couple days, and will obviously discuss this fall along with some less painful things. I am hoping he’ll order a CT of the chest because I have 4 thoracic disc herniations at about the same level as this rib pain. I hate docs just ‘guessing’. 🙂 Thanks in advance! Hi Terri, the only major muscles in that area would be the pec major, obliques, or abs. It is possible to have a contusion in this area, however, bruised ribs with such a fall is likely, and this mechanism of injury can also lead to fractures. I understand this happened like a year ago at this point and I apologize for the extended delay in my answer, and I hope you are doing well at this point? What was the ultimate outcome? My injuries from falling of ladder in 2007. I feel bad for anyone with injuries, regardless of level of injury. Agreed. I haven’t met an injury I like.